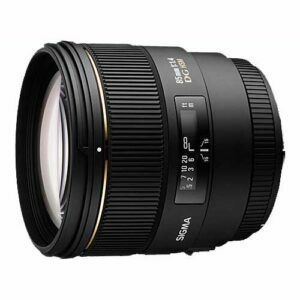 Lens Description: Large aperture medium telephoto lens optimized for use with digital SLR cameras and is especially ideal for portrait and low light photography. Designed with SLD glass and a glass mold element excellent color correction is achieved for all types of aberrations and superior optical performance is ensured. It is equipped with a rear focus system that minimized fluctuation of aberration caused by focusing and the Super Multi Layer Coating reduces flare and ghosting even in backlight photography. HSM (Hyper Sonic Motor) ensures quiet and high speed autofocus capability and the round 9 blade diaphragm creates pleasant out-of-focus highlights. It comes with a Petal-type hood to block out extraneous light. For digital cameras with an APS-C size image sensor, a dedicated hood adapter, which expands the length of the lens hood is supplied and enables the hood to block out extraneous light more effectively.